This manual establishes the design, weights, and gauges of symbols, and the type styles and sizes to be used in compiling and drafting standard topographic maps prepared by the Army Map Service for publication at the scale of 1:1,000,000. During the compilation stages, strict adherence to symbol specifications shall not be required. Line weights and gauges may be varied twenty percent (20%), plus or minus, from prescribed specifications. In using the symbols specified for drafting, strict adherence to the prescribed weights and gauges must be maintained. The examples below are map symbols for permanent ice and snow features. 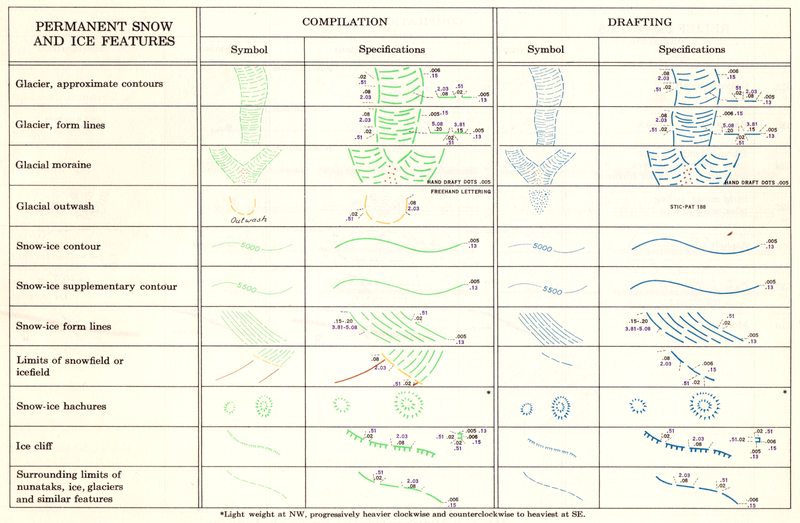 The 1953 Army Map Service guide Symbols for Small Scale Maps details map symbol specifications for compiled maps (left, below) and drafted maps (right, below). Compiled maps are the initial draft of a map, where diverse sources of information are drawn together. Using the compiled map, a cartographic draftsman creates the final, drafted map, suitable for printing. Map compilation is a technical term in cartography whereby a map of a large area is made up of pieces maps of its smaller component areas. These maps of component areas may be at different scales and projections. Therefore, there scales and projections are made same so that different component maps may be aggregated to form a single map of a larger area. Very often to remove overlapping or voids between different component maps, a process of smoothing is carried out. In manual cartography it depends on the knowledge and experience of the cartographer. In digital cartography, there are certain algorithms to perform smoothing and many more may be borrowed from the problem of image fusing in remote sensing and GIS. You have confused map compilation by the process of map making. The blog entry quotes the original source. Obviously, the difference between map compilation and map making varies in definition.